Very spacious 3 bedroom / 2 bath standalone house that sleeps 12. Great for two families to share because of LARGE kids room. Living Room – comfortably seats 8 - 10 with couch, loveseat, and recliners. TV with cable and a DVD player. Kitchen – Full kitchen with stove/oven, dishwasher, microwave, toaster, coffee maker, glasses, pots & pans, utensils, for 12 and eat in table with seating for 6. Washer / Dryer. Dining Room - table seats 6 - 8 and is adjacent to the kitchen.A/C in dining area Bedroom 1 – Queen bed. Air-conditioned. TV with cable. Bedroom 2 – Full bed. Air-conditioned. TV with DVD Player. Space for an air mattress. Bedroom 3 - 4 twin beds; 2 full beds; sleeps 8. Space for an air mattress in the room (or in the closet it's so big!) Off-street parking for 2 cars Front porch has table, chairs, and propane BBQ grill. 2 ½ blocks from the Beach and Boardwalk. 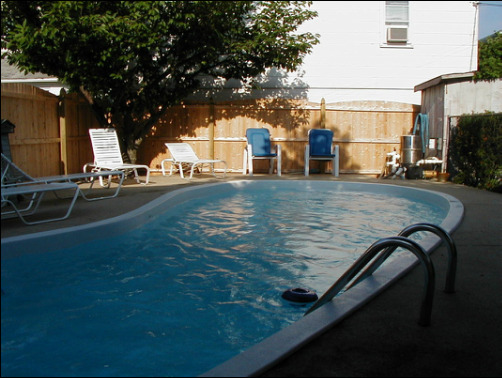 Free Wi-Fi Internet access Shared In-ground swimming pool with expansive deck (opens last week in June) Group Rates: $2000 for Fri - Sun(Weekends only). Plus $1,000 refundable security deposit. Memorial Day weekend $2500. SPECIAL OFFERS: Weekend of June 10- 12 $1000 with a $1000 sec deposit.